Thomas Sherlock Graham, J.P., was a Public Accountant, Auditor, and Arbitrator, of Temple Chambers, 99 Princes Street, Dunedin. Mr. Graham, who was well known in the New Zealand for many years, was born in Ireland, and educated at a collegiate school in the South of Ireland. He commenced his business experience as a clerk in the Provincial Bank. After several years' service in the city of Cork, he was appointed to the Union Bank of Australia and came out to Melbourne in 1862.
years, when he joined the firm of Bing, Harris and Co., first as manager of the business, and subsequently as partner, and as such successfully conducted the business for many years. In 1879, Mr. Graham severed his connection with the firm and joined Mr. R. A. Low in the old established firm of Heymanson, Low and Co., wholesale boot and shoe importers, and on the closing up of that firm, about 1892, he started his present business. Mr. Graham undertakes auditing and public accountancy work, as well as arbitration and general commission agency business. He is auditor for the Dunedin city council, Caversham gasworks, and for a great many important private firms. He was chairman of the Chamber of Commerce. For some years he interested himself in cricket, and is now president of the Dunedin cricket club. Mr. Graham was vice-president of the Dunedin athenæum and mechanics' institution, a trustee of the Benevolent Institution for some time, and now holds office as secretary of the United Districts charitable aid board, and of the hospital board. On the initiation of the Union Insurance (now Alliance) Company, Mr. Graham was managing director in Dunedin. He has interested himself in the volunteer movement, and was captain of the Dunedin Irish Rifles for some time. He was married in 1874 to a daughter of Mr. C. H. Kettle, who surveyed and laid out Dunedin in 1846; this lady died in 1876, leaving one daughter. Mr. Graham, in 1888, married a daughter of Mr. Low and has, issue of this marriage, two sons and one daughter. Thomas Sherlock Graham was a member of both the Irish and English Constitution. On the establishment of Lodge Shamrock, No. 448, I.C., on the 28th of March, 1866 Mr. Charles White was the first Worshipful Master, and Thomas Sherlock Graham, who was one of its founders, was its founding Senior Warden and the second Worshipful Master. On the establishment of Lodge St. Patrick No. 468, I.C., Bro. 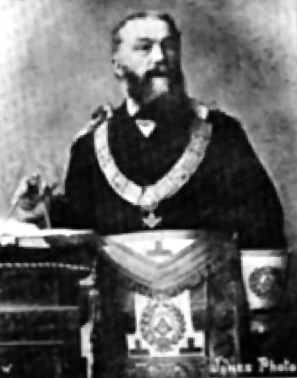 Graham was a founding member and first Worshipful Master when the Lodge was constituted by Bro. Julius Hyman on the 3rd November, 1881. However he was only in office for three months when he resigned to become the District Grand Master of the English Constitution. When he was installed as the Right Worshipful District Grand Master Otago and Southland, English Constitution, the ceremony was actually carried out by Rt.W.Bro. G. Pierce, Provincial Grand Master of New Zealand, Irish Constitution. He held this distinguished position from 1881 until 1918, a period of some 36 years. He was District Grand Master for the South Island of the Mark Degree, English Constitution, and a member of several private lodges. He was an honorary member of Lodge St. Mary's Chapel, Edinburgh, No. 1; Past Prior of the Priory of Otago (Knights Templar); Past Sovereign of the Knights of Rome and of the Red Cross of Constantine, and Past Z of the Otago Royal Arch Chapter. Mr. Graham is also a member of the Veterans' Association of San Francisco, and a 33° under the Supreme Council of Scotland. Provincial Grand Master of New Zealand, Irish Constitution.